During a day of peaceful protests across the country, several protesters are shot and killed. Video evidence confirms that the shots were fired from pro-government militia. "If it turns out López has been criminally charged without any serious evidence that he instigated the violence, this would clearly be an abuse of power." Lopez posts a video on YouTube from hiding, in which he calls for continued peaceful protest, and promises to appear publicly in a protest in two days. "I have nothing to fear, I have not committed any crime. If there is some decision to illegally arrest me, well, that is where I will be." He says: "If my imprisonment helps awaken our people... then this infamous imprisonment that Nicolás Maduro wants so openly and cowardly, then for me it will have been worth it." Lopez turns himself in to the National Guard. He urges Venezuelans "to embrace our right to protest. But do so peacefully and without resorting to violence." Venezuelan President Nicolás Maduro states in a speech later that day: "I said send him to jail, and that's what happened, and that's what will happen with all of the fascists." Amnesty International calls the arrest a "politically motivated attempt to silence dissent in the country," adding: "Venezuelan auhtorities must either present solid evidence to substantiate charges against López or release him immediately and unconditionally." 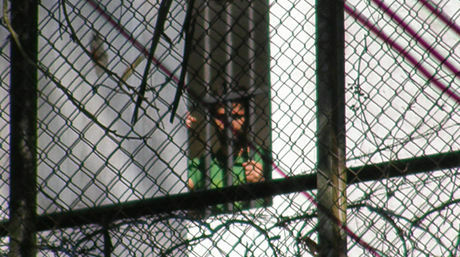 Lopez is transferred to Ramo Verde, a military prison outside of Caracas, where he continues to be held. Maduro government issues an arrest warrant for Carlos Vecchio, the political coordinator of Voluntad Popular, in what appears to be a systematic attempt to shut down the political party. No evidence has yet been produced in either case. In a New York Times opinion piece written from his prison cell, Leopoldo calls for engagement from the international community, writing: "To be silent is to be complicit in the downward spiral of Venezuela’s political system, economy and society, not to mention in the continued misery of millions." Venezuelan government formally charges Leopoldo with crimes that would carry a 14 year prison sentence. 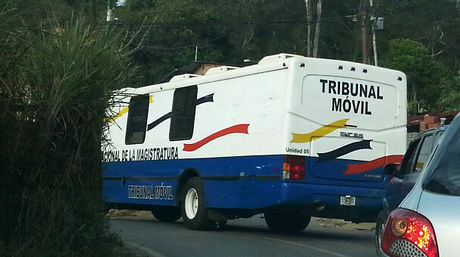 The hearing is held in a bus, outside of the Ramo Verde military prison. Leopoldo celebrates his 43rd birthday in prison. He is not allowed any visitors on his birthday. Family and friends gather outside the prison. Leopoldo López becomes the first person to receive the Harvard Kennedy School Alumni Achievement Award in absentia. His wife Lilian and his sister Adriana receive the award on his behalf. Leopoldo Lopez Ordered to Stand Trial: Leopoldo’s pre-trial hearing began on Monday June 2 and concluded in the early morning of June 5 when Judge Adriana Lopez ruled that Leopoldo must remain in prison and await a trial this summer. Leopoldo Lopez's wife, Lilian Tintori, and her international human rights lawyer give press conference at the National Press Club and release a white paper on Leopoldo's legal case. Lilian was joined by Leopoldo¹s mother, father and two sisters in Washington to call for the immediate release of Leopoldo and all the other political prisoners in Venezuela. Venezuelan President Nicolas Maduro demands U.S. release of Puerto Rican nationalist, Óscar López Rivera, in exchange for Leopoldo’s freedom in exile, a clear violation of due process. Former Presidents Sebastián Piñera of Chile and Andrés Pastrana of Colombia are refused entry at prison gate in their attempt to visit Leopoldo. Leopoldo gave a remarkable 30-minute interview by phone with CNN Español, which was abruptly cut off when prison guards realized he was speaking to the media. In this interview, we hear Leopoldo describe, in his own voice, his daily struggle against the injustice of the Venezuelan dictatorship. One-year anniversary of Leopoldo’s imprisonment. Leopoldo López ends month long hunger strike in response to the Maduro regime’s decision to set a date for parliamentary elections.